Marvel at those majestic buildings harbouring the biological heritage of nations. Natural history museums. 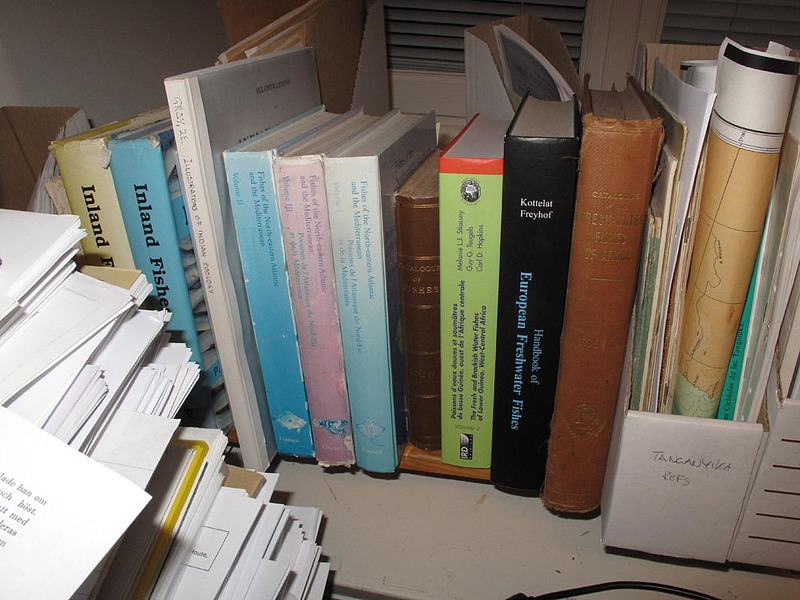 Other research collections. The millions by the thousands of corpses and skins, leaves and stems, rocks and gems. Wondering about the shadows cast from time to time across the occasional window lit night after night. Dinosaur or Man, ghost or guard? Strolling through the galleries, what’s behind all those doors that remain locked? More treasures or just the junk? 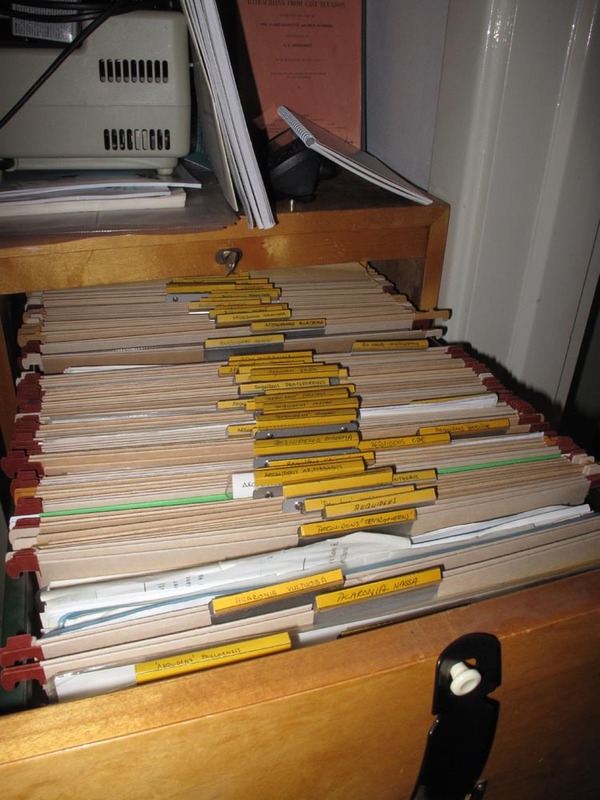 It is not so straightforward to explain what goes on in research collections, and difficult to imagine up. But for sure, there are collections safe in store rooms. And there are the scientists and the collection care staff. And, of course, some administrators. 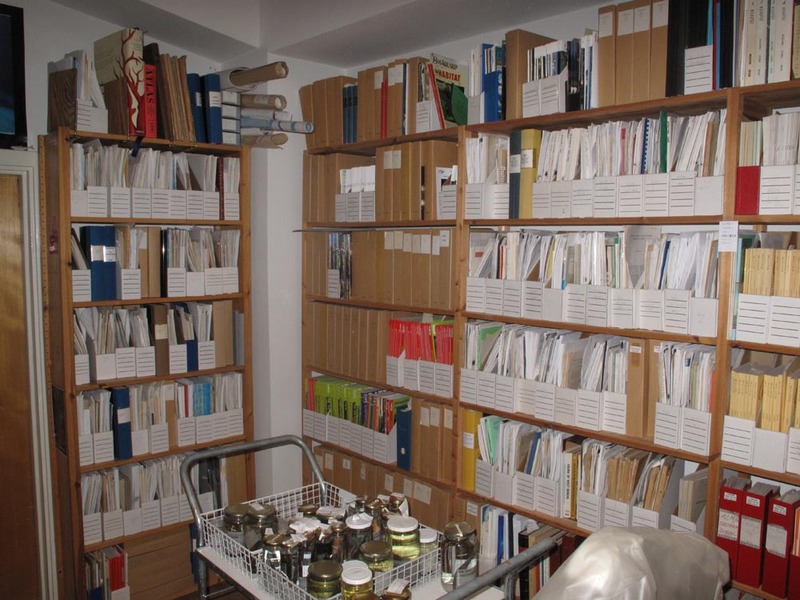 There is always something you can see of collections, and there are the reports, the scientific and not so scientific papers and web presentations, so nothing is really hidden. But have you ever had a glimpse of a professional abode therein? Is it roomy or squeezy, white-walled or padded with trophy heads? Is there always a Larson in lieu of less intelligible art? Coke or coffee? White coats or tees? When I was so much younger than today I had an idea but not all the imagination. Then, indeed a long, long time ago, I was led by Gordon Howes through a maze of corridors and through the one locked door after the other to arrive at the magical heart of the fish division of the British Museum (Natural History) – now known by a lesser name – and there it was, the air, perfused by alcohol fumes, the books, the microscope steady on the bench, and the uncmfrtbl (so they pronounce it) chair, the tall windows and the big men, books, books, and reprints, reprints, greasy jars, soft dead fish with their autographs helped to them by the wisest of ichthyologists, Günther, Boulenger, Regan. Enchanted, it was a revelation of what life ahead was to be like. And now it is all gone, all the smell, the patina, the deoxygenated atmosphere, the dirty windows, and the kind of yellow Wild microscopes. Everything is new and shining and the nervousness – or was there any – about that spark that would send the alcohol to flames and the building to a cloud of dust, it is no longer there, fire regulations everywhere. And all the other museums are going modern as well. Actually I like the new style too – the facelift is an expression of value and respect for the scientists and their working material. 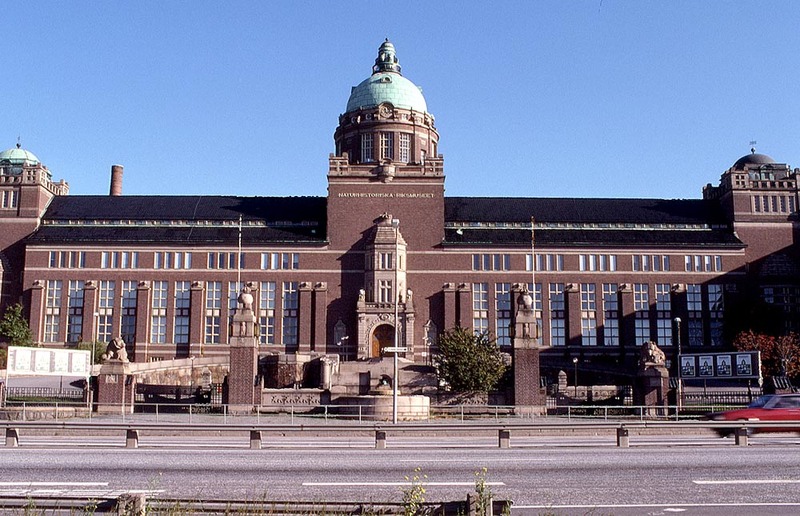 As I much later came to my museum in Stockholm, it was just like that, dirty, dark, dull, and a bit dumb. Now it is full of fresh fish, gas driven chair seats, top-end computers, motorized microscopes, and all the papers are becoming pdfs. As I started on this essay, it was because I were soon to move to new quarters, smaller, newer, and the present, acquired coziness would be part of history. I have been in this office since … 1980? and it was upgraded only once with a little paint and new floor. Since nothing of the classical ichthyological laboratories of the overladen, all-inclusive kind was saved elsewhere (or ?… challenge me!) I decided to photo-freeze a bit of ichthyological history, speaking for many a demolished scientist’s office as new times have moved in. End of the commercials, take a seat and enjoy my research workshop, something like six by three meters and the ceiling truly up in the sky almost. 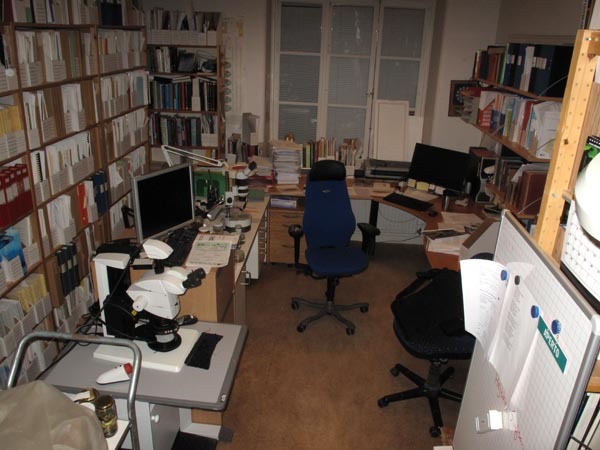 If you ever wondered what a classical fish researcher lab looked like a late afternoon in the winter of 2012, here are all the details (well, a good part of them). If you came upon this text my daily practice unbeknownst, you may wish a confirmation that I am a fish systematist – there it is. 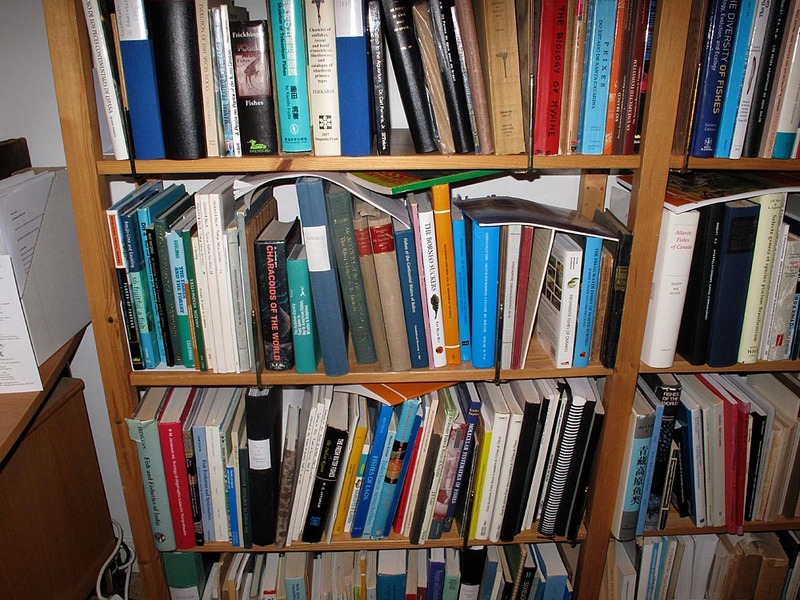 What you see to left and right, front and back, upp the walls and on cabinets and desks – are books and reprints. A sine qua non for life and science alike. 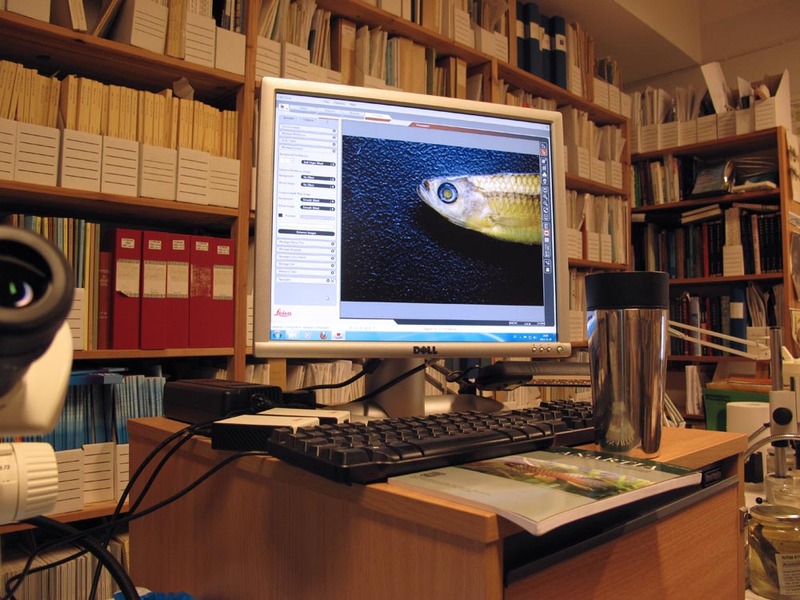 The books and reprints in my office are those that are required for ongoing projects and such that are needed for various office tasks such as identifying fish for the public, colleagues and whoever calls. Books that are needed for finding information fast. Highlights are of course the Scott Liddell Greek lexicon, and Erik Wikén’s fabulous Latin for botanists and zoologists (Latin för zoologer och botaniker), in Swedish. I certainly need that copy of Artedi all the time, and right now I am trying to speed learn about Tanganyika cichlids from Günther and Boulenger to Poll and a massmess of molecular writings. If the hand library fails, topping it is the department library which has one of the best collections of fish books, journals, and reprints. Would it not suffice, there are of course AnimalBase and the Biodiversity Heritage Library. 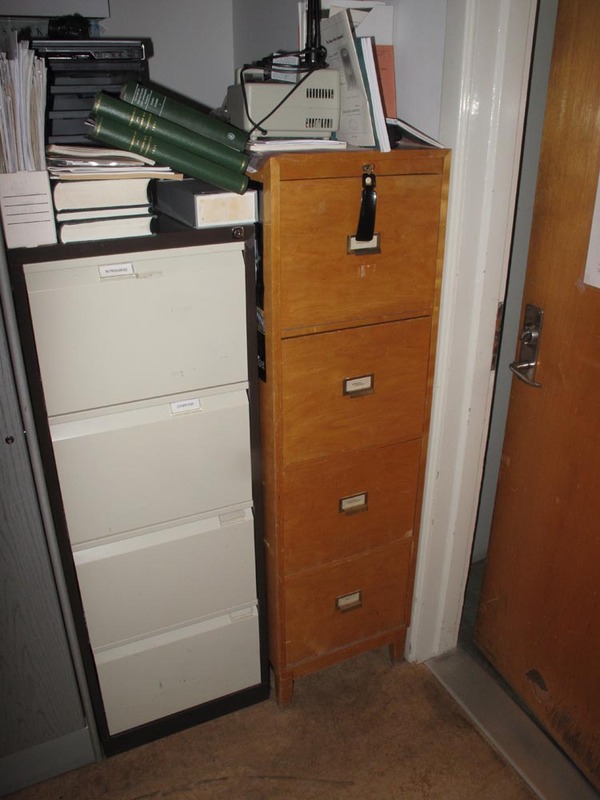 It takes two (actually three) computers to keep things running, and all data are saved in paper format in three filing cabinets, a dossier for every species and dossiers for other data. Two microscopes may seem overkill, but one is dedicated for photography and one for fish examinations. So one can work in parallel. You will not find many jars in the study, because of fire regulations. Only lesser amounts of ethanol are permitted in offices those days, and the jars needed for the time being are assembled in trays on a cart for convenient transport back to the store rooms. Stop the presses! Miraculously, this installation still remains. By a lucky chance the move was cancelled at the very last minute, and consequently change is not going to play with my order. Not now. I am happy. What about you? And, what’s your office like? 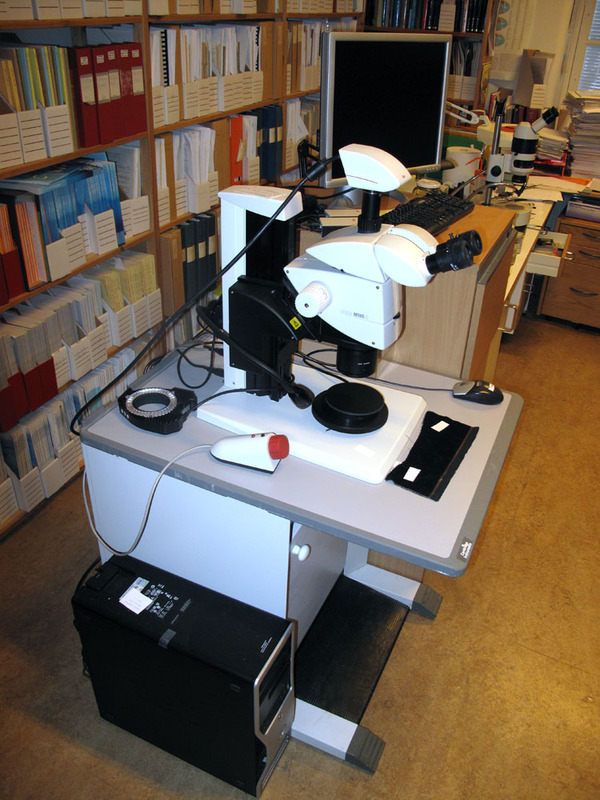 Posted in Books, Fish, Ichthyology and tagged books, lab, microscope, museum, office on 26 December 2012 by Sven Kullander. This is the first day of silence after coming back to Stockholm from the XIV European Ichthyological Congress in Liège, Belgium (3-8July). Whereas the meeting, attended by a round 260 delegates from all over Europe and occasional from farther away, was well organised and quite informative, heat hit us and noise. Coming from a cold Swedish summer, the rainiest June in 200 years, Liègian temperatures were an amiable mid-20s and only one shower wet us. But it took buying a few more T-shirts (from Swedish H&M) to feel comfortably neat around the clock. I loved the heat, actually. But the noise… Constructed as an intricate labyrinth of narrow streets between stone and brick buildings, sounds from everything sounding cascaded through the streets of Liège and there was no escape even in the hotel room. Most remarkable, however, were the frequent ambulances and police cars continuously racing in and out of streets and alleys, with a 2000 db (exaggerating, but well …) high pitch sirens resounding all over the municipality. Quite remarkable. Liègians seem to love noise more than anything else. Fleeing the street sirens I had a brief encounter with a real one in the lower floor of the combined public aquarium and zoological museum (Liège Aquarium-Museum) , which was also the venue for the Congress. 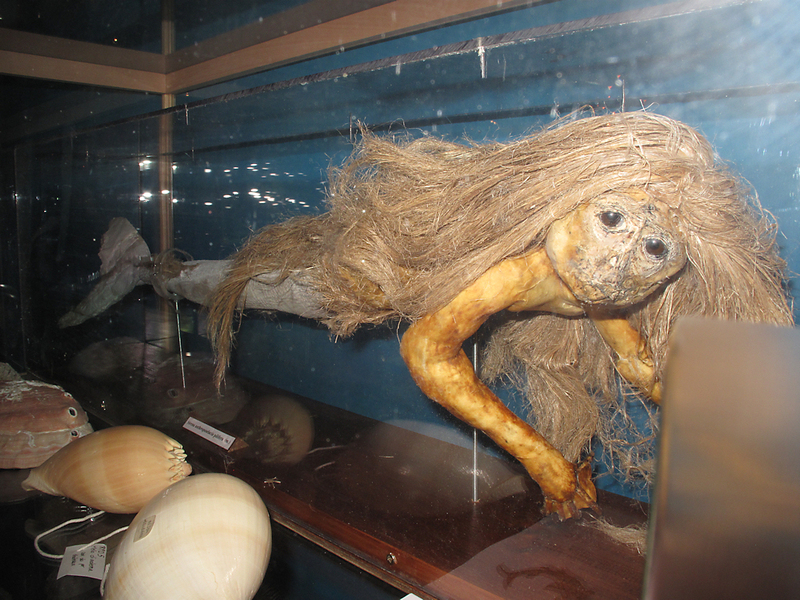 This little lady had a glass cage all for herself, in swimming pose, and is indeed the first real stuffed mermaid I have come close to in real life. The rest of the aquarium is maybe mainly for the local audience. The Museum, however, two floors up, was neat and had a number of interesting objects, making it well worth a visit. Displaying real animals in systematic order it was ideal and should be a lead star for other natural history exhibits. One table display featured a charming set of castelnauiana that was news to me, including drawing equipment, notebooks, and sketches from the later days of Francis de Castelnau (1810-1880). 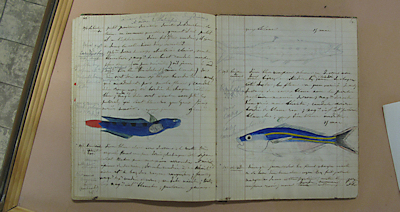 Apparently Castelnau donated specimens to the museum along with the notebooks, and there is now a plan to repaint the stuffed fishes based on the drawings. The Congress? Well, I probably sat more than the usual number of sessions. 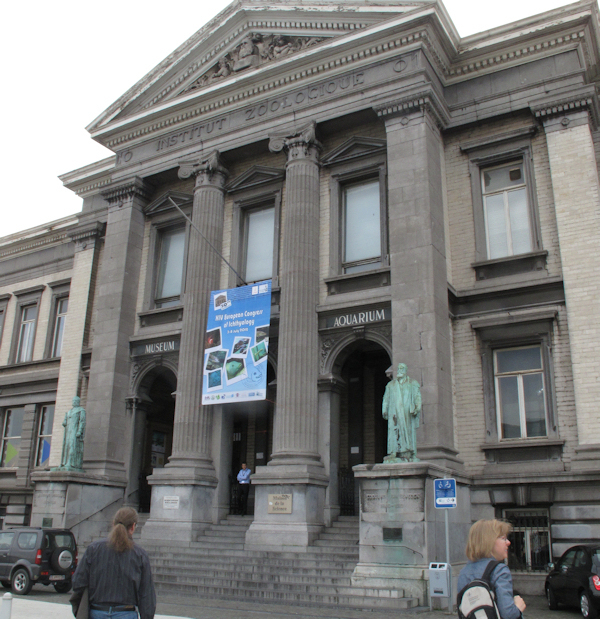 Belgium has a big advantage in having several institutions providing training and research opportunities in morphology and anatomy, making it an interesting breeding ground for evolutionary and functional analyses of fish physionomies and behaviour, and has also a very strong research in African freshwater fishes. This balanced very well a large number of more or less conclusive or inconclusive molecular presentations. I travelled with NRM FishBase staff Michael Norén and Bodil Kajrup who presented a talk on our ongoing hagfish research, and a poster of a mapping of Swedish fish type localities, respectively. I have been too occupied with other things recently, and did not feel like giving a talk. Some other time. Maybe on mermaids. This is not the last mermaid post. It didn’t turn out a meeting report, at least. By the way: The European Ichthyological Congresses are organised locally (this one mainly by the University of Liège) but are actually a significant part of activities of the European Ichthyological Society. The first congress was organised in Sarajevo in 1972. I was one of the organisers of the Congress in Stockholm in 1985. Membership in the society is open for all, and there is a website (http://artedi.nrm.se/eis/) providing the details how to join. Posted in Ichthyology, meetings, Not categorized, Travel and tagged aquarium, Castelnau, fishes, mermaids, museum on 9 July 2012 by Sven Kullander. 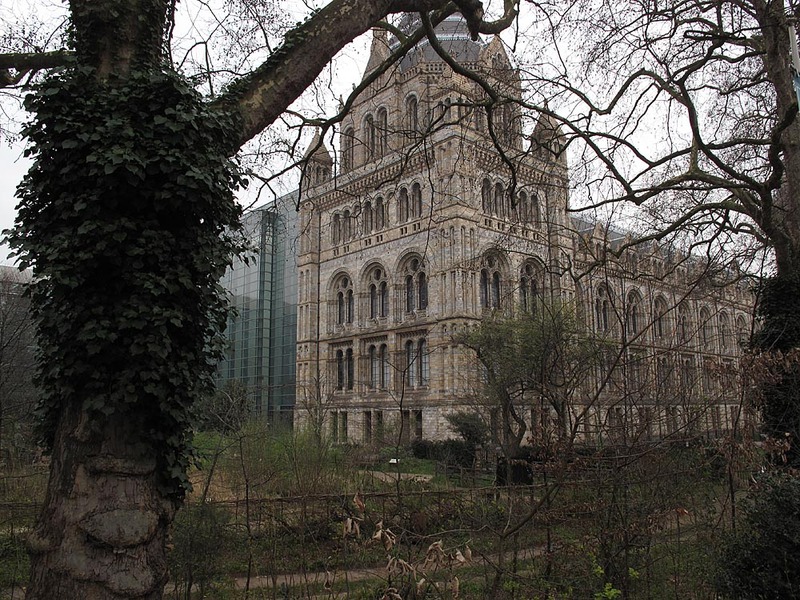 It is true that most of the world’s population lives some distance away from a major natural history museum. Even if you live close and come often to visit the exhibits, what you experience is only a minor part of the activity, the objects and the spirits of a natural history “museum” (better called science collections or research collections). Only a fraction of the millions of objects are on display, and nearly all of the research and curation is out of sight. Lack of public access to collections and research areas is sometimes lamented by the public, and in response to that some scientific collections do provide guided tours of the galleries for those with a special interest. With the right guide it can be exciting, but expect that for the non-specialist research collections tend to be highly repetitive, with large numbers of seemingly identical objects, and storage conditions are optimised for long-term storage and not for easy access for viewing. The researchers and collections staff are of course not on display. They have to work on, eternally understaffed, with their task to investigate and maintain the collections. Many scientific collections provide good insight into the research going on by public lectures and content-rich web sites. 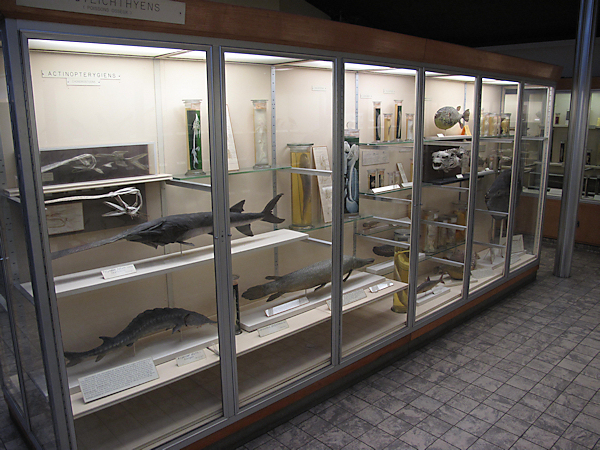 Projects like FishBase and GBIF make data and specimens from many collections available from their portals. On occasion of the tricentennial of the birth of Petrus Artedi (1705-1735), Elizabeth Watson, Node Manager at GBIF-Sweden, made a film illustrating the change of scientific ichthyology from the lone man in the 18th Century taking notes by the lake to the industrial process including all sorts of technology and a rather large number of people that make Ichthyology at the Swedish Museum of Natural History, one of the major natural science collections in Europe. One of the blessings of the Internet (in this case YouTube in particular) is that everyone with a reasonable bandwidth can now get behind the scenes in Ichthyology, in a shorter version of the Artedi film, illustrating the work of today. 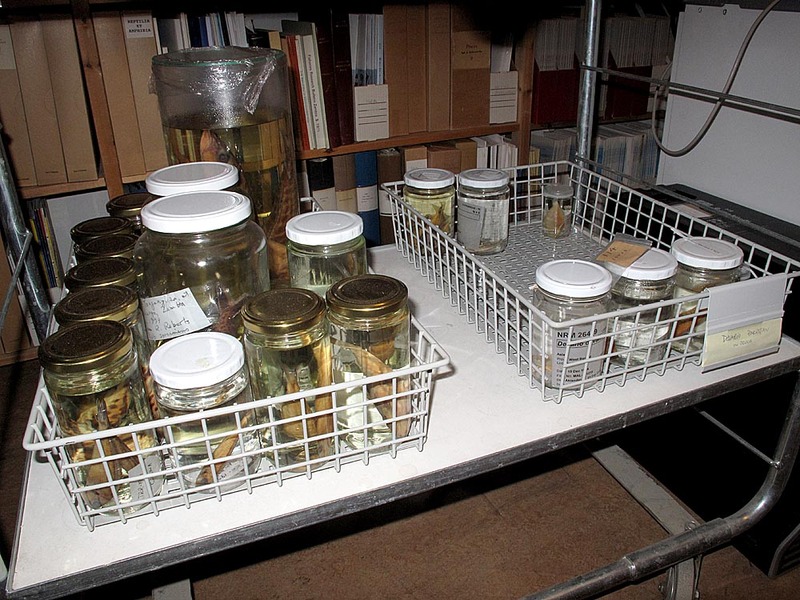 Posted in Ichthyology, Video and tagged behind the scenes, fish collection, ichthyology, museum on 13 July 2009 by Sven Kullander.